In the market for a new solo microwave? Today we take a look at the new shiny Sharp R270SLM - a 20 litre microwave, finished in silver, and offering 800w of power, and priced at the lower end of the typical price bracket for solo models. Simple to use, no fuss operation. Works very well too. Simple but effective design. No clock feature. A minor criticism, but one which you may wish to bear in mind. The Sharp R270SLM provides 800w of power, and features a sleek silver colour scheme. The 20 litre capacity means it may be a touch too small for very large plates - but it fitted all of the ones we tested. It features 10 different power levels, as well as 8 auto cook menus - all of which are easy to operate, thanks to the controls being very distinctively labelled. In terms of design, it is principally finished in a smart yet modern silver and black finish, with a traditional feel to it. It should match the majority of kitchen decors, as well as fit in with most kettle and toaster appliances - if buying this as a present, it's a fairly safe bet that it will match the recipient's kitchen. Inside you'll find the turntable measures 27.2cm in diameter, and is made from glass, as well as being removable for easy cleaning. The digital timer goes up to a maximum of 99 minutes, which makes this ideal for slow cooking food over longer periods of time. External measurements are 45.2cm by 26.2cm by 37.0cm, and inside it measures 31.1cm by 21.1cm by 28.7cm. Overall our testers thought this silver microwave oven worked very well, and represents excellent value for money - made by Sharp, it should offer reliability and years of service for a relatively small price tag. 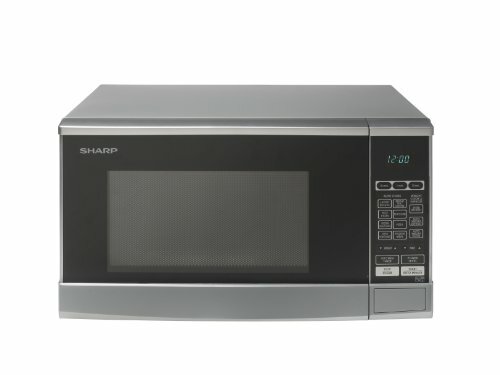 Build quality is substantial enough to give us peace of mind, and based upon past experiences with Sharp appliances we'd imagine this microwave will offer years of usage. Overall this is a very well made solo microwave - quite small at only 20 litres, but works really well. The Sharp R270SLM comes highly recommended.